Borneo Artifacts, one of the leading and trusted online antique gallery in Malaysia has made it possible for global clientele to access authentic Borneo, Malaysian and Indonesian art and antiques at very justified asking prices. freePRnow.com, 11/08/2018 - Malaysia, (November 08, 2018) – The love for antiques and authentic Asian cultural art has been rising with enthusiasts around the world at individual and commercial levels, for all the right reasons. Borneo Artifact, the leading Asian Antique gallery in Malaysia, has been catering to this ever-rising demand literally faultlessly for the past 25 years. This unique Asian Vintage art gallery currently hosts some of the most sought-after pieces of authentic Borneo Art and artifacts that currently stretch to cover 29 different categories. Totem poles, tribal masks, art pieces, containers and containers sets and even jewelry for that matter have been fetching phenomenally high demand from global enthusiasts over the past decade. Besides these, Borneo Artifacts has created an indelible name in the global antique market for housing authentic Malay Dagger, which is also known as Keris; an antique weapon that was once carried by the Warrior Dayaks, the native tribe of the region. Global clients of Asian Vintage art and crafts that usually come back for more, have further expressed that their faith in Borneo Artifacts has maximized not only for their strict adherence to authenticity of the antiques, but their dedication to maintaining impeccable client service as well. Borneo Artifact is a reputed Asian Antique Gallery that has over 25 years of experience in dealing with very high-quality authentic Borneo art and artifacts that currently stretches to over 29 different categories. The gallery ships its products to global clients both individual and commercial and is recognized for exceptional client service. 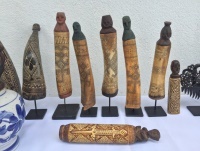 Antique enthusiasts that wish to learn more about Borneo Artifact in terms of products and prices can visit https://borneoartifact.com/.